Shropshire Garden Design Ltd is one of the leading garden design and landscaping companies in Shropshire. In the early days, we offered purely garden design services but then in later years joined forces with landscapers with a variety of skills and we now offer the full range of garden landscaping services. We specialise in low maintenance garden makeover projects around Shropshire but we can do everything from one day garden clearance to two month garden makeovers. The company itself has been trading for 12 years but some of our team members have over 25 years experience in the industry so we have a wealth of knowledge covering a multitude of professional disciplines. We have built up a good reputation within that time. The company comprises a 4 man team covering all of the skills and disciplines required to complete every aspect of garden landscaping to the highest standard. 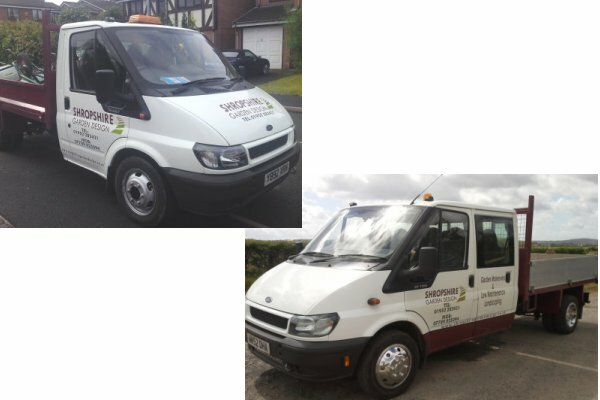 Our men are professional, very courteous and reliable, and are all used to working in a customer focued environment where we have to be aware of noise levels and showing courtesy not only to our customers but also to neighbours. We do not use any third party contractors and do not require skips. We use our own trucks to transport materials and waste, and we have all the tools and equipment necessary to carry out the work. We have our own facilities and do not require house access. All we require from the customer is access to the garden, and ideally an outdoor electric point and an outdoor tap. From the time we first meet you to the completion of your project we aim to provide a professional service at all times. If we arrange to meet at a prearrranged time then we are always there. If we cannot get there for any reason we will always informthe customer. Full written quotations are provided within the timescales agreed. Work is completed within the timescales and to the budget agreed in the quotations unless agreed otherwise. Here are a few tips to help spot those rogue traders, click here. We always ensure that meeting times are honoured. We arrive at jobs on the days and times we say we will be there. Unless agreed beforehand due to bad weather, we will always stay on the job we are on and finish it to the customers satisfaction before moving on to the next job. It is incredible how many landscapers and builders will skip from job to job when they feel like it. We will not do that. Unfortunately the recession created	a host of cowboy landscapers who are more than willing to take your money and offer you very little in return. If you are getting several quotes then please ensure that they are from registered companies who are fully insured to give you legal protection and peace of mind. In October 2011 a Shropshire police chief issued a reminder about doorstep strangers offering to do work on the home or garden. "My advice is quite clear - don't accept work from strangers knocking on your door. They will often use intimidating behaviour to convince you to have work done that is usually not needed, the end result will be sub-standard, costing much more than the original quote"
In addition a lot of companies are not actually licensed to carry waste. If your project will include waste clearance, the contractor should carry the necessary certificate. In addition to guarantees offered by manufacturers on materials, all work carried out by Shropshire Garden Design Ltd is fully guaranteed. Shropshire Garden Design Ltd is one of the only garden design and landscaping companies in Shropshire that is listed on the Shropshire, Telford and Wrekin Trader Register operated by Telford & Wrekin Council. Under the scheme we are obligated to follow a Code of Practice designed to ensure we provide honest and fair trade and deliver good customer service. Our Trader Register certificate and a copy of the Trader Register Code of Practice are available on request. 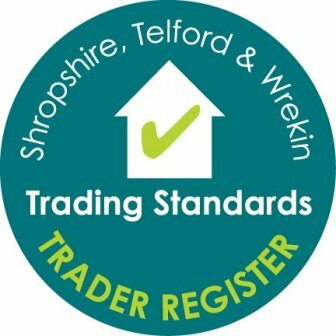 All of our work is fully guaranteed and regulated under the Trader Register Code of practice. Customer service is sadly lacking in most companies nowadays but we pride ourselves on giving the customer what the customer wants in a professional and courteous manner. Every job we do is completely unique because people are unique and no two people will want exactly the same thing. Our design and landscape service is tailored to the needs of the individual customer. Our men are courteous and reliable and they are proud of the work they produce. Our garden designers and landscapers are customer focused and you will be consulted at every phase of the design and landscape process. A large percentage of our work is repeat business and referrals from existing customers who have been impressed with our service. Indeed apart from this website we do not advertise anywhere as the majority of our business comes from repeat business and referrals. You are welcome to contact any of our customers to enquire as to our workmanship and standard of service. Here are a few of our latest references. Original letters and company certificates can all be viewed if you decide to book a consultation with us.